If you have got too much paperwork and not enough space then off site storage is for you. You could use the space currently housing your documents a lot more effectively and possibly even generate an income from it. Are you using alternative storage spaces to keep your records for example your garage, basement or a self store facility? If yes then you need to consider the security of the storage environment you’re using and whether your documents are safe from such factors as damp, flooding and pests? If your documents are not safe you could be breaching the Data Protection Act and be risking your businesses reputation! Are you currently paying too much for your Archive Storage? If so DataSpace’s Archive Storage services could reduce your Archive Storage expenditure and we can even help with associated “out fee’s” from your incumbent supplier. DataSpace are dedicated Document Management specialists providing flexible, reliable and compliant services to small/large businesses and organisations in a variety of business areas in the private sector and public sector. DataSpace’s services include Secure Archive Storage, Electronic Document Management Systems, Media Storage, BS10008 accredited scanning and digitisation systems, Confidential Destruction services and many technologically advanced systems more. DataSpace facilities are BS5454 accredited which is the British Standard for ‘The Recommendations for the Storage and Exhibition of Archival Documents’. DataSpace facilities are also monitored by online CCTV 24/7/365. DataSpace electronic systems and processes are accredited to BS27001 and BS10008 which are the Gold Standards for data entry, digitisation, transfer and management of electronic information. Our HQ is based in Cheshire with additional offices in Scotland, Spain and the Netherlands. Get in touch and get a quote! 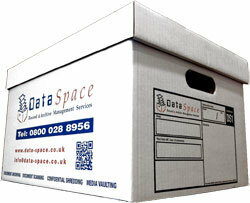 Contact us on 0800 028 8956 or email us info@data-space.co.uk. DataSpace can collect your items from their current storage location at a convenient time to suit you. If your items are not already in Archive Boxes don’t worry. We sell strong durable Archive Boxes and if required DataSpace can provide members of our team to pack your documents away including completing a contents list.